A most valuable and elusive book. Thompson’s discussion of how the value of an object is dynamic, rising and falling depending upon context as it ages was perfectly suited to my study of scrap recycling markets. Most objects will decline in value, but perceived scarcity or other changes of valuation might cause prices to rise as the object ages. Sometimes we see this in antiques, vintage automobiles, and real estate pricing. Thompson’s work remains relevant, earning separate entries for the book and author in the Encyclopedia of Consumption and Waste. 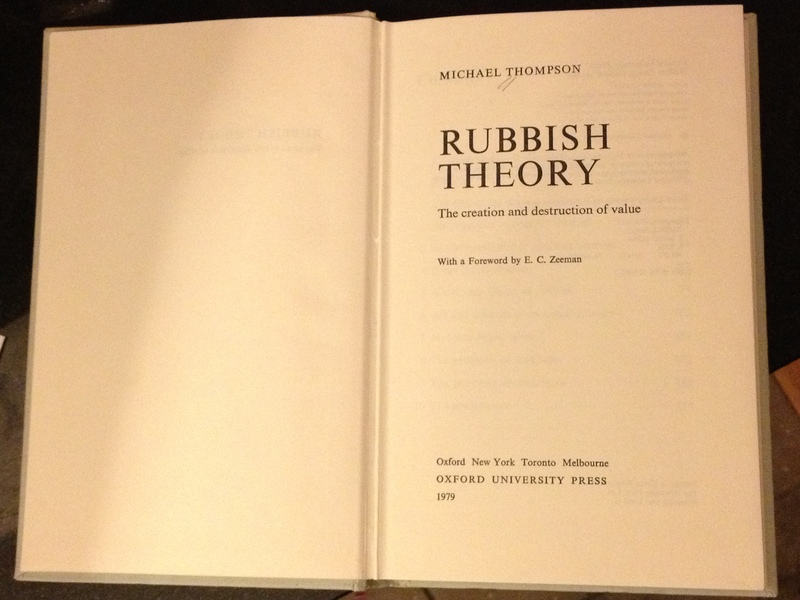 The history of Rubbish Theory (the book) is also an object lesson in rubbish theory (the theory). Oxford University Press published the book in 1979, listing the hardback for £7.50. The book went out of print, presumably because the market was a handful of academics and libraries, and most who were likely to purchase the book had already done so while it was in print. About a decade ago, once I started teaching Thompson to my undergraduates, I devised a little exercise in rubbish theory. Since the students were now experienced internet shoppers, I instructed them to go out and see who could find the lowest price for the book. Using Amazon, Abebooks, and other outlets, students found the price of the book varied with its condition, but uniformly, all copies were expensive. Most years, students found the book for about $200. Occasionally, one would find a copy as cheap as $120. Those $120 copies were more frequent after the economic meltdown in 2008, but as late as 2010 (when I last taught my Waste seminar at Roosevelt University), the book tended to price in the $160-$170 range. The value remained largely stable for years. I’m teaching a new seminar (Production, Consumption, and Waste) at Pratt this semester. The first three weeks are devoted to theoretical understandings of waste, so we discussed rubbish theory (and Rubbish Theory) last week. Turning to Abebooks and Amazon, we found variations in the book’s price. $250. $181. $128. $103. (Hey, that’s pretty good.) $74. $48. $42. $42? And listed in very good condition? The students were not yet out the door to lunch when I placed my order. At long last, my own copy! Rubbish Theory arrived in the mail this week. My copy, a hardback lacking a dust jacket, had been remaindered from an academic library. Despite the low price, it is in excellent condition – the binding is intact, and the pages are neither torn nor (to any serious extent) marked up. For whatever reason, the perceived value of the book has declined to the point that I can finally own a copy without feeling like I chose the book over paying for food for the week. My long exercise in the dynamic value of objects has a happy ending. I no longer need to rely on the dog-eared copies I made, and I can add a chapter to the story I tell students when we do this exercise. Perhaps Oxford University Press can add another chapter to the story by reprinting the book after 34 years. Might that reduce the value of my copy (more copies in print) or increase it (the relative scarcity of a first edition at a time with heightened interest in the book)? Time, as Thompson points out, may tell. This entry was posted in consumption, Encyclopedia of Consumption and Waste, history, waste on January 31, 2013 by Carl Zimring. On the observation of Dr. Martin Luther King Jr.’s birthday, I posted about the significance of the 1968 Memphis sanitation workers’ strike. 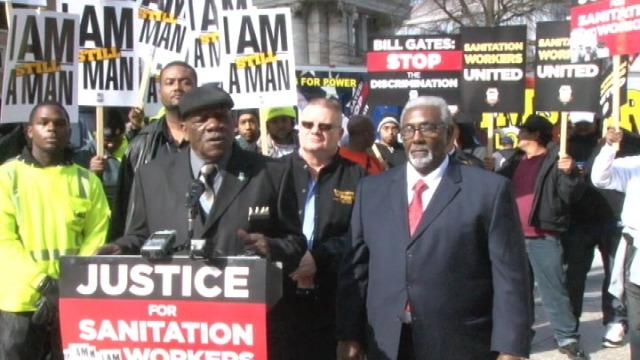 Today comes word that two of the men who marched for the right to organize 45 years ago, Alvin Turner and Baxter Leach, are now marching with Atlanta-area sanitation workers who are fighting for their right to organize. DeKalb sanitation workers want better pay and working conditions. Turner and Leach says it’s the same thing they fought for more than 40 years ago. “This brings back the memories that happened in 1968. The same thing is happening now that happened then,” Turner said. “It just fills my heart to see how they carry on Martin Luther King’s dream…They made me almost cry,” said Leach. DeKalb sanitation workers say they have not received a raise in more than four years. The workers have been meeting with the county commission about recognizing their newly formed union. 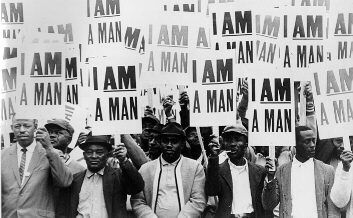 In Going Down Jericho Road, Michael Honey discusses the legacy of the Memphis strike, including some of the limitations placed on public-sector unions in the years after the Memphis workers won their right to organize. The DeKalb County action is a reminder that the struggles of history continue today. This entry was posted in history, waste on January 22, 2013 by Carl Zimring. 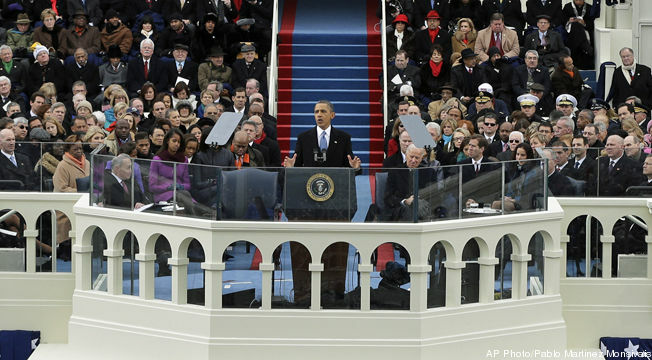 President Obama delivered his second and final inaugural address on the day the nation observed Dr. Martin Luther King Jr.’s birthday. Fittingly, this address advocated the respect and protection of civil rights, as well as the respect and protection of the environment. 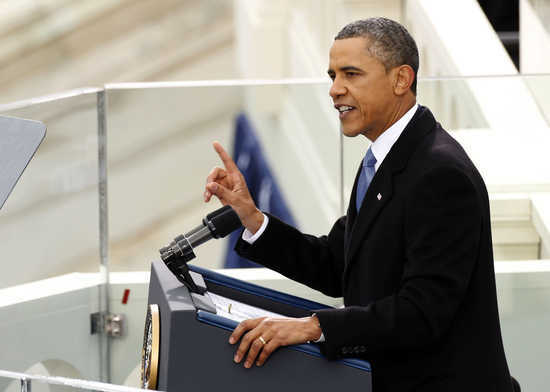 If we define sustainability as the three Es of the environment, economy, and equity, this speech was the most explicitly sustainable speech any American president has delivered. The full transcript is online. Here are a few choice passages. Many challenges lay ahead in ensuring the laws of the United States of America afford the protections outlined in today’s speech. But the attention to social equity, more comprehensive environmental protections and a more just economy lay out a vision for sustainability from Barack Obama at the midway point of his presidency. This entry was posted in events, history on January 21, 2013 by Carl Zimring. 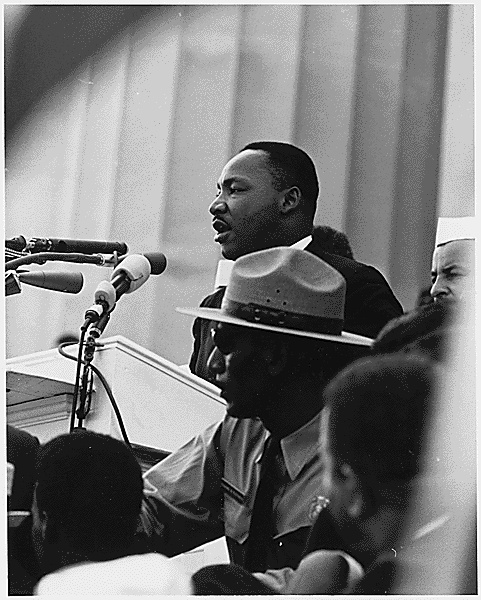 Today is the observed holiday for Dr. Martin Luther King Jr.’s birthday. 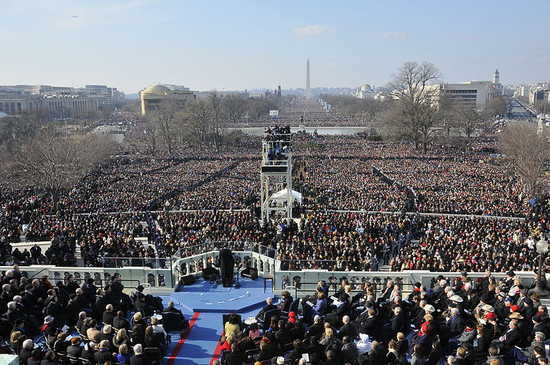 It is also the day celebrating the second inauguration of President Barack Obama. Much has been — and will be — said about an African-American reaching the highest job in the land as a fulfillment of Dr. King’s dream; I want to observe this day with a reminder of Dr. King’s quest to ensure that all workers’ dignity be respected. (Including a quote from our current president.) 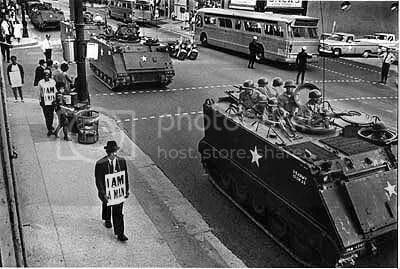 This post is adapted from a series I wrote in 2008 on the fortieth anniversary of the Memphis strike. The event that triggered the strike took place on February 1, 1968. Two workers, Echol Cole and Robert Walker, were on a garbage truck. By “on” I mean they were riding on the back of the truck as was procedure in Memphis’s Department of Public Works. In a pouring rain, the two men tried to take cover as best they could by climbing onto a perch between a hydraulic ram used to compact the garbage and the inner wall of the truck. Somewhere along the drive, the ram activated, crushing the two men to death. One had tried to escape, but the mechanism caught his raincoat and pulled him back to his death. The timeline of events in the strike that lasted from February to April is too rich to recount in a diary: AFSCME has a brief chronology online, but a true appreciation of the diverse interests and activists brought together in Memphis requires a longer read. I recommend (again) reading Michael Honey’s Going Down Jericho Road to gain an appreciation of why thousands of people in Memphis and nationwide mobilized as a result of the strike. It is as engrossing and moving as any American history book I have read in the past two years, and Honey articulates why so many people were spurred to take action despite the risks. Today, forty-five years after the strike, its imagery has been embraced by our president. Though demonized by the municipal government in Memphis, and investigated by the police and FBI, the power of the movement in the streets has influenced those seeking power in the halls of Washington. The injustices are still in place, but one change over the past forty-five years is a recognition of how widespread those injustices are. Fourteen years after Memphis, an African-American community in Warren County, North Carolina decided it would not stand for a PCB dump to be placed next to their homes and they laid down on the road in front of bulldozers to prevent the digging. These Americans made history as the first people in the United States to be arrested preventing the construction of a dump. The residents of Afton, North Carolina failed to prevent the dump’s siting, but in the months and years that followed, the environmental justice movement emerged to fight back against the decades of discrimination that made shunting the dirty work of garbage collection to blacks “normal” in Memphis. As I argued when we observed Dr. King’s birthday in January, the rhetoric and tactics used in the Memphis strike influenced the activism of the environmental justice movement. Though that movement has evolved and grown over the past twenty-five years, it owes debts to the sanitation workers who decided that enough was enough in February of 1968. Today, let us remember that forty-five years ago, several hundred such people rose up for respect, for dignity, and for a more just society. Let us remember the sacrifices of Dr. King, yes, but also of Echol Cole, of Robert Walker, of Larry Payne. Let us remember the courage and resolve of T.O. Jones and every preacher, every union member, every activist, and every person who worked to bring a measure of justice to Memphis forty-five years ago. Let us remember, and let us try to use their example to make our own communities more just today and in the days ahead. This entry was posted in history, waste on January 21, 2013 by Carl Zimring. The first week of Spring semester is ending at the Pratt Institute, and there are still a few seats available in one of my sustainability courses. While SS 490-03 Power, Pollution, and Profit and SS 490-27 Production, Consumption, and Waste have reached their enrollment capacity, SUST 201P The Sustainable Core still, as of Thursday evening, has four seats available. The next meeting of SUST 201P is next Wednesday, so there’s time to catch up on the readings if you wish to add the course in Week 2. If you are a Pratt student and have any questions for me about SUST 201P, please feel free to contact me at czimring (at) pratt (dot) edu. 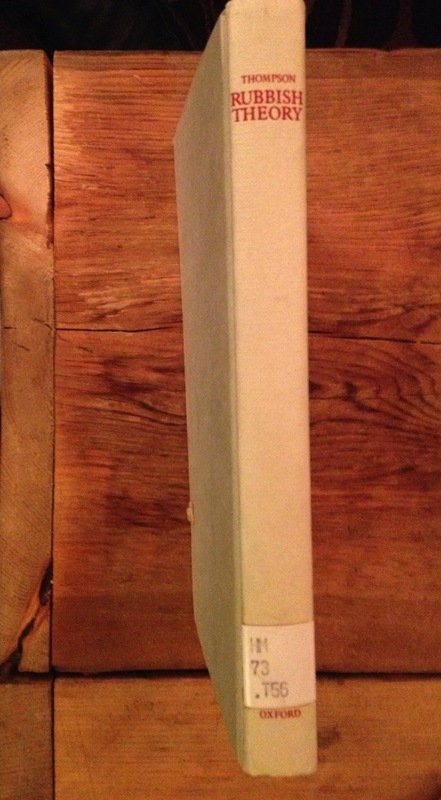 This entry was posted in consumption, recycling, teaching, waste on January 17, 2013 by Carl Zimring. No one will walk into Cooperstown and be honored by the Baseball Hall of Fame this year. Players among the career leaders in home runs and victories were eligible for induction, but no one will be welcomed into the Hall this year. Headline on ESPN’s MLB page the day before Hall of Fame voting was announced. The proffered reason for the lack of inductees this year was cheating. In an article headlined “Keep It Clean,” ESPN reporter Wallace Matthews (one of the members of the Baseball Writers’ Association of America who determine the inductees) opined that steroid users, as cheaters, were not worthy of selection, and his voting choices eliminated any players suspected of using steroids. Other writers, either wary of sorting the evidence of who used steroids and who did not, or disgusted by the idea of voting in any player active in an era affected so much by steroid users, submitted blank ballots. Since a player requires 75% of all ballots cast to gain induction, a blank ballot counts against all. Denial of induction to any player from the “steroid era” thus ensures the Hall is clean. This stance is interesting for several reasons. Baseball has kept cheaters out of the Hall in the past. Although Joe Jackson’s hitting performance as an American League outfielder measures up to several of his contemporary early twentieth century players who are in the Hall, his ban in 1920 for involvement with gamblers in the fixing of the 1919 World Series meant he was never seriously considered for induction. More recently, all-time hit leader Pete Rose was banned for his association with gambling, a ban that has prevented him from ever being eligible for consideration. A clear precedent exists for keeping cheaters out. Not all cheaters, but some cheaters. Steroids are now considered by MLB as Performance Enhancing Drugs (PEDs), a wide variety of substances banned because they are considered to provide their users unfair advantages against clean opponents. Some of these substances are based upon hormones made in the human body, others are synthetic compounds that affect metabolism. All are perceived to provide short-or long-term affects on the human body that significantly alter athletic performance in ways deemed to be unnatural or unfair. This model is used in Olympic competition and medal winners are frequently stripped of their awards after failing drug tests. Similar sanctions were recently levied against cyclist Lance Armstrong years after his seven Tour de France championships. If an anti-PED stance is common in the Olympics and cycling, professional baseball is unique among American team sports in considering PED use as a disqualification in Hall of Fame voting. Despite the growth in size, speed, and musculature (as well as performance statistics) in the NFL, NBA, college football, and college basketball over the past quarter century, little concern over PED use affects those sports’ Hall of Fame inductions. The NFL now prohibits players from being selected to the Pro Bowl in the same year when the player tests positive for steroids, but to date football voters have not considered PED use as a mark against prospective Hall of Fame candidates. Inducted members of the Pro Football Hall of Fame likely include men who have used steroids. The same is true of the College Football Hall of Fame, Basketball Hall of Fame, and Hockey Hall of Fame. Baseball’s stance on PED use in the twenty-first century runs counter to its taboos and norms in the twentieth century. Joe Jackson and Pete Rose are outside the Hall due to gambling (though gambling and association with gamblers did not keep legends such as Ty Cobb and Tris Speaker out of the Hall despite being forced to resign their jobs as managers due to gambling allegations in 1926). The scandal that ended Jackson’s career was the revelation that members of the 1919 Chicago White Sox took money from gambling interests and may have deliberately lost the World Series. Deliberately losing threatened public interest in baseball as a competition, and the scandal’s results included the creation of a new position (commissioner) to police the game and a rule banning association with gamblers that was posted, Ten Commandments-style, in every major-league clubhouse. If throwing games defiled the sport, the ban on gambling was an attempt to cleanse baseball of its sins. Until the current era, the Original Sin of gambling has been the taboo disqualifying prospective Hall of Fame members. Players were not been denied induction for forms of cheating which gave them a better chance to win games. Although use of the spitball was banned before he was born, Gaylord Perry flaunted his association with the pitch, even writing an autobiography titled Me and the Spitter during his career. Gaylord Perry is lauded as a 300-game winner and was inducted into the Hall of Fame in 1991. Nor was PED use in baseball novel in the 1990s. Following widespread use of amphetamines in the US military during World War II and the Korean War, these stimulants made their way into baseball clubhouses, assisting performance in an era when westward expansion and (after 1960) longer seasons made greater demands on players’ endurance. Players from this “golden era,” including Mickey Mantle, Yogi Berra, Willie Mays, Hank Aaron, and the acclaimed fighter pilot Ted Williams, are characterized as the greatest of players despite playing in a time rife with illegal amphetamine use (widely credited with improving concentration and endurance). In the 40 years after World War II, career records in home runs and stolen bases were broken by men who easily won enshrinement in the Hall. Amphetamine use was considered widespread throughout the late twentieth and early twenty-first century, and sanctions for amphetamine use by active players are the same as the sanctions against steroid users. The same cannot be said about the BWAA’s treatment of retired players from the era of widespread amphetamine use. Little in the way of suspicion or sanction ever mentions amphetamines, and association with an “amphetamine era” does not taint the legacies of such Hall of Famers as Joe Morgan, Nolan Ryan, Reggie Jackson, or George Brett. The case against all-time hit king Pete Rose has everything to do with his association with gambling and nothing to do with the greenies that fueled Charlie Hustle’s play into his mid-40s. Perhaps steroids in football and amphetamines in baseball are perceived as enhancements rather than blights on their respective games, and thus not worthy of historical sanction. Steroids in baseball, conversely, are now perceived by journalists as distinctively corrupting that sport over the past twenty years. A Hall without inductees in 2013 is considered a clean Hall because voters attached stigma to any and all players associated with the steroid era. Cleanliness (as Mary Douglas emphasized in 1966’s Purity and Danger) is about power, about fear, and about establishing norms. The history of the baseball Hall of Fame, with its spitballers and speed-freaks reminds us that true cleanliness is illusory. In the biological realm, we know this to be true. Our obsession with disinfectants result in superbugs; our need to constantly remove waste from our bodies and homes puts tons of excrement and synthetic garbage in our waterways and landfills. Absolute purity is impossible to reach, there is no such thing as clean. Even if defining purity in the Hall of Fame is simply a lack of PEDs, it is hard to argue that the current hall is not already populated by players who have augmented their bodies with these substances. Not that the writers’ reaction has much to do with the defiling of players’ bodies. While public service announcements broadcast during baseball games warn young athletes of the health hazards of steroid use, voters do not much express much worry over whether or not Barry Bonds will die of heart disease or cancer related to steroid use. Nor do voters state concerns over amphetamine use (which has had serious health consequences for far more Americans than steroid use does). Purity of the players’ bodies is less a concern than purity over the official record of the game’s statistics. It is no accident that the man who purchased Bonds’s record-breaking 756th career home run ball branded a giant asterisk onto it. The asterisk attempted to explain, even delegitimize, a number of potentially great historical significance. (In a sport, it seems, where such numbers have more emotional resonance than do numbers demarcating performance in football, basketball, and hockey, if we can judge by the rhetoric of journalists covering these sports.) To say that the experience of this historical moment is messier than a number by itself might reveal. History can serve as a cleanser. No living men will enter the Hall if Fame this summer, but three plaques will be added to its walls. The Veterans Committee voted to admit the long-dead umpire Hank O’Day, nineteenth-century player Deacon White, and Col. Jacob Ruppert, who owned the Yankees back when Babe Ruth made a mockery of the existing record books. None of these men will make a speech, and nothing these men can do now will receive approbation, absent the remote chances their corpses are exhumed to test for illicit substances. Dead men, it is believed, tell no lies. These inductions of men who lived and died before World War II seem safe, even if the game was hardly pure in their time. Their legacies somehow gained in stature in 2012 through no new work of their own, but because their past contributions were viewed through a new lens. Perhaps the players passed over in the voting this year will receive different consideration in the future. Perhaps writers distanced from the speculative frenzy of who doped and who did not will grow to see the inflated power totals of the past two decades as similar to the decade of widespread gambling, or the inflated offensive statistics of the 1930s. Or perhaps they will consider the effects of PEDs in this particular era singularly tainting to the sport (despite increased attendance at major league parks during the period). However the voting develops over the next several years as several players with historic achievements gain consideration by a now-vigilant electorate, this is an historic time to witness how notions of purity are shaping the way baseball history is told. This entry was posted in history on January 9, 2013 by Carl Zimring.